Some people balance these two worlds well, but I struggle with this at times, and my silence here over the past couple of weeks proves to me that I have a lot of work to do in this area. I’m learning a lot about this actually, and continue to strive to be more open and transparent throughout the journey. So, what’s been going on these past couple of weeks? On Saturday, October 29, the Ian Somerhalder Foundation had its first fundraising event here in Atlanta, and the production crew for Kids of the Gulf was there to capture the experience on film. 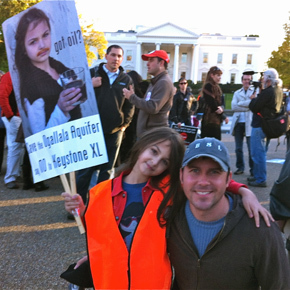 I have been working with many of the volunteers from ISF on multiple projects, including Kids of the Gulf and the Keystone XL pipeline issue, and that weekend offered an opportunity to get to know some of these incredible people face to face. We had a chance to have dinner and drinks together the night before, and the voices and avatars from months of online conversations had the opportunity to translate into the faces and voices of dedicated people who are actively making the world a better place to live for us all. 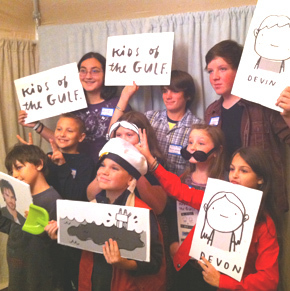 The benefit itself was a lot of fun, and it was the first time that Devon and Devin got to meet the team for the documentary that we’ve all been working so feverishly on. 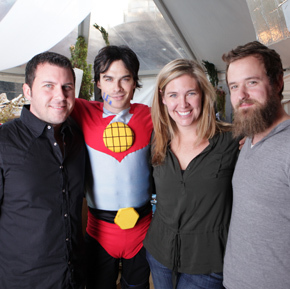 Being on Halloween weekend, the costumes were quite entertaining to be sure, and Ian himself arrived as Captain Planet, which seems somehow very fitting, given the mission of ISF. Seeing kids and youth from around the country and even around the world gave me another huge dose of inspiration that we can indeed make big changes in this world when we combine our energy and push for positive steps forward. Fast forward one week, and a group of strangers from Atlanta hopped in my car to drive to DC for the Tar Sands Action Keystone XL pipeline demonstration. It was a fascinating experience to pick up people I’ve never met before and drive together for 10 hours through the night to get to our nation’s capitol. Although we were just meeting, there was a sense of camaraderie that felt like we had known each other for years and were ready to get to work on this important issue. The experience in DC was absolutely incredible and felt like history in the making for sure. 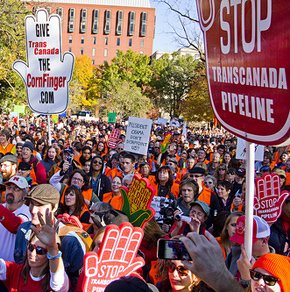 12,000 people from all over North America gathered together on a crisp, sunny Fall day in Layfayette Park in a showing of solidarity encouraging President Obama to deny the permit for the Keystone XL pipeline. I’ve been working with the organizers of this movement for months and watched the momentum build with each passing day, but Sunday’s rally was beyond anything I could have expected. Layfayette Park was jammed with people of all ages, backgrounds, ethnicities, and political affiliations, but we all had one thing in common; the desire to protect the environment and the people who would be affected by this pipeline’s construction. After several speakers made remarks from the stage, the sea of humanity fanned out to completely encircle the White House itself, and people from all walks of life joined hands to show support for the President as he prepares to make this important decision. To say that Devon’s sign captured some attention would be a gross understatement. For hours, I walked with her as people from all over stopped to take pictures of this poignant display held by a 7-year-old. We met a lot of people face to face that beautiful afternoon, and had a chance to reunite with familiar faces that have been working side by side on this issue for months. Organizations that send out emails, petitions, newsletters, etc. came to life that day. NRDC, Sierra Club, NWF, 350.org, CREDO, Friends of the Earth, and many, many others joined forces in an unprecedented showing of solidarity on the Keystone XL issue. UPDATE: Yesterday, we got incredible news on the Keystone XL issue – the decision on the permit has been delayed indefinitely pending a new pipeline route and new environmental review. This is a huge victory for the Tar Sands Action movement, and while it’s not the knockout punch that we would like, it’s an important milestone in stopping this environmental disaster from happening. With hundreds of thousands of people watching this time around, it won’t be so easy for the State Department to conduct a blatantly corrupt and biased environmental review, and with an impartial environmental review, I’m confident that the project will not move forward. It’s a big win for democracy, and I’m proud I was able to play a part in it. The point I want to drive home here is that real world, face-to-face interactions are incredibly important to us, regardless of how much technology and the internet give us the ability to communicate from afar. There is no substitute for an evening of bonding with people that are actively working together, and you can’t fully translate the energy and enthusiasm of a 12,000 person rally on Twitter, Facebook, or online petitions. Every now and again, we need to step away from technology and lean in to people who are right in front of us. And there are times when we need to get off our butts and take to the streets to let our leaders know how we feel about issues that are important to us. The next time you have the opportunity to connect with someone for the first time in person or spend time with an old friend or family member, try saying yes instead of putting it off. Even better, turn your phone off or don’t even take it with you. Be in the moment with the people in front of you and resist the temptation to ‘check in’ or document the entire experience moment by moment. How do you balance your online social time with your offline social time? Do you feel compelled to try and share each experience you have as it’s happening? I’d love to hear how you handle it.